I have a country shapefile and a dataframe with coordinates of bird sightings. My goal is to "rasterize" the shapefile and compute the number of points within each grid cell. Specifically, I want to end up with a grid-cell level dataframe containing lat/long of the centroid of each grid-cell, the district census code of that grid cell (which is contained in the shapefile attribute table), and the number of points falling in the grid cell. I would like to keep cells with no points in them and leave number of points as "NA". This is what I have so far. I get stuck after finding the district code of each cell. I guess the next step is to convert the raster to a polygon grid and then overlay the points on it? Is there an easier way? Next a function to do the work. Writing functions is a good way of making code that you can easily test on small data sets (like the one I just made) before running it on anything else. Always do this. Not the answer you're looking for? Browse other questions tagged raster r overlay or ask your own question. Updating raster value to reflect total number of points within cell using Python? How to add habitat information from shapefile to an existing DF dependant upon grid reference? Constructing cell-year panel by aggregating point data in each cell using R? 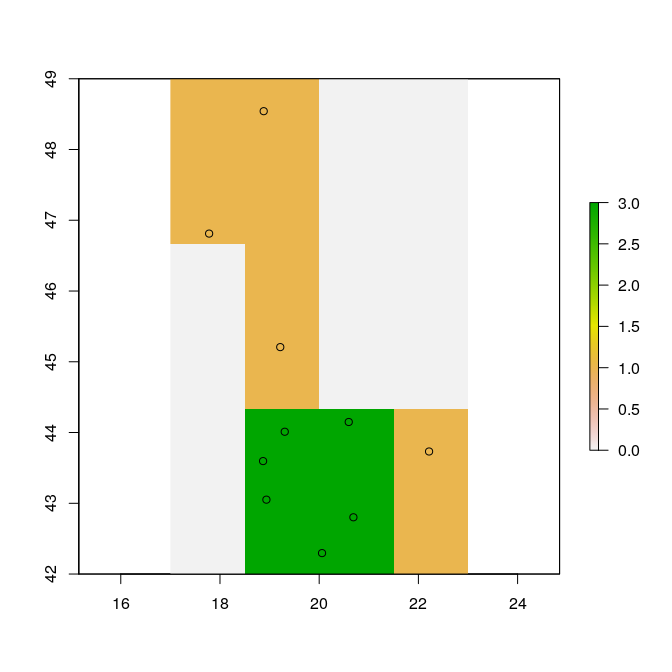 Assigning raster values to spatial point using R? Counting number of polygons within polygons using R?